We provide opportunities for children to engage in social action and to work as part of our local community. We encourage children to take their full role in society, responsible for their own actions and prepared to take a lead role in the future. We undertake to achieve this through our curriculum work by developing understanding of key issues, how to debate, how to disagree with others whilst respecting their opinions and rights and to stand up for what we believe in. We use our Collective Worship time to encourage a social and moral response to issues facing us in society today. Children have the opportunity to participate in democracy within school, to choose books, curriculum topics and themes, to elect our school council and to create their class agreements with their teacher. Children are encouraged to have a voice. Children are encouraged to use this through voting and democratic means. Our children learn about our rights and responsibilities within our school community and how this relates to the wider local, national and global communities of which we are part. 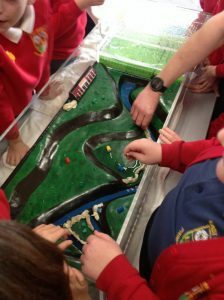 Children were horrified to learn about the impact the continued use of plastic was having to sealife. They discussed the issue with Tracy Brabin MP and a local councillor when they visited school. 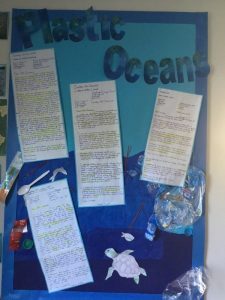 Following the visit, the children wrote to the local council about Kirklees Council's record and imploring them to make changes locally to help have an impact globally. 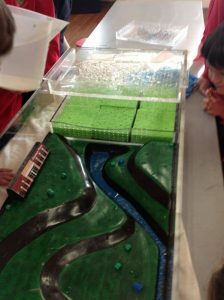 Learning about flood plains and considerations needed when developing land. We worked with Kirklees Emergency Planning Team to think about the impact flooding has on local communities. We use our times together as an opportunity to learn about people who have changed the world through their social action and teach that individuals can make a big difference. We also discuss how a small step by one person can make a big difference to another individual. We always start by sharing our smiles! Annually, we hold a short concert and an afternoon tea for the pensioners in East Bierley. The children thoroughly enjoy setting up for the afternoon, serving drinks and performing dances and songs at this event. Our PTFA also join us to run this event ensuring it is a school community event. Our School Council are keen for us to play our role in our local community. This school year we sang at The Hawthornes, a local care home. In the new term we hope to build our links with them so our children can all benefit from spending time with them. A new venture for us as we move into January. Our children understand the importance of action to make a difference. We often talk about being the change you want to see in the world during our Collective Worship. We have children who talk to us about collecting litter locally - making that immediate difference in our local area. Children and parents too sometimes ask if we can support a specific charity. We have had bun sales organised by children in year 6 and recently had a bun sale held by one of our parents. We talk about alternative gifts in place of sending cards or gifts too. We respond to requests within the community too and our Christmas Choir sang carols for an event at a local business. We embed our core values in all we do at school ensuring children have the opportunities to demonstrate them in all aspects of life. This includes within school. Friendship is a way everyone can make a difference wherever they are. 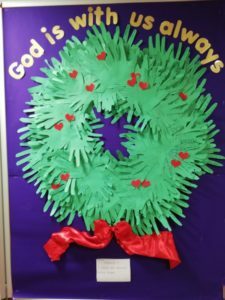 This year we made our Advent wreath out of our hands of friendship.